WHAT: A two-session workshop. Day 1 will include presentations on designing effective writing assignments, creating useful evaluation rubrics, and enhancing students’ writing experiences by following recommendations from both writing teachers and Writing Center tutors. Day 2 will be an informal discussion session, with opportunities for participants to develop, revise, or refine assignments and rubrics for their classes. WHERE: Root Hall A275 (the Department of English’s Laptop Lab); located on the long second-floor hallway that runs east–west. We’ll post signs. WHY: If writing is to play an integral part in our courses, then preparing effective assignments, making decisions about evaluation strategies, and adopting “best practices” will enhance the work. Register for the workshop by contacting the Foundational Studies Office by telephone (extension 3940) or e-mail (wendy.cox@indstate.edu). Registration is limited to twenty-eight. 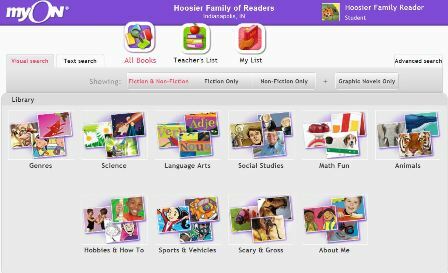 Hoosier Family of Readers initiative – fantastic digital reading for all Hoosiers! Through the Hoosier Family of Readers initiative, students and their families across the state will have unlimited access to reading material on myON, giving families an opportunity to share rich literacy experiences together regardless of their socioeconomic status or whether or not there is a proficient reader in the home. More than 3,000 digital books from Capstone and additional publishing partners, ranging from illustrated and picture books to chapter books, graphic novels, literary non-fiction, photo and informational texts spanning multiple eras and cultures. Digital books from the following publishing partners will also be available: August House Little Folk/ Story Cove, Bellwether, Hothouse, Mikaya Press, Orca, ReferencePoint, Saddleback and Sylvan-Dell. The collection includes 70% nonfiction, 10% Spanish or dual language and 20% Hi-Lo titles, and is continually growing. A wide range of titles and topics provides varying levels of text complexity and support close reading in a range of genres and content areas, including history/social studies, science and technical works. There’s no limit to the number of students who can read the same book at the same time on myON. Students can download up to 20 titles for offline reading using free mobile apps for iPad and Android devices. This site will tell you how to login and has screen shots to help you figure out navigation. UPDATE: WTHI-TV did a story that aired on May 8, and included some footage in the library and some words from Reference/Instruction Librarian Steve Hardin. Research by an Indiana State University doctoral student found that students did equally well on a test whether reading from a digital book or a printed one. Jim Johnson, who also is director of instructional and information technology services in the Bayh College of Education, surveyed more than 200 students. Half of the students used an iPad2 to read a textbook chapter while the other half of the students read from a printed textbook chapter. The students then took an open-book quiz with eight easy and eight moderate questions on the chapter. Are there any significant differences in reading comprehension test scores of students when using paper texts versus digital texts? Are there any differences in reading comprehension test scores with regard to gender or between text formats and gender? Is there a relationship between the hours of experience using tablet computers and reading comprehension test scores among study participants? Men had a mean score of 12.87 out of 16 while women had an average score of 13.60 out of 16. Students age 21 had an average score of 13.87 out of 16 while students 25 and older had an average score of 13.5 out of 16. He also found that there was no significant difference on test scores whether or not the participant had past experience on a tablet. “The delivery method didn’t make any difference,” he said. Of the participants, 88% said they had read books on laptops, netbooks or desktops while 51 percent said they had used an iPad, iPhone or iPod to read books. Additionally 36.1 % said they used a cell phone to look at digital texts. When asked what they would like to use, 69.1 %s aid they would want to use an iPad, iPhone or iPod to read digital text and almost the same amount, 68.7 %, said they would prefer a laptop, netbook or desktop computer. Only 48.1 % said they would want to use an e-book reader. In considering digital textbook readers, 74.7 % said the ability to browse the Internet was important while 70.4 said they wanted to read email, 62.7 % said cheapest price was important. Of the prices students said they would pay, 40 % said between $100 and $200 while 16.7 % said they would pay between $200 and $249. However, some problems remain in the digital textbook market. Students expressed concern about eye strain from reading text on electronic devices. Johnson said one participant became so nauseous reading the digital text that she was unable to complete the study. Also students expressed concern about the high price of digital textbooks as well as the battery life, software and reliable technology. In focus groups after the initial test, Johnson said students didn’t like the high cost of digital book rental or the inability to resell digital textbooks. “A lot of the students didn’t like the idea of renting books,” he said. Johnson said there needs to be further discussion about the cost of digital textbooks and how to keep costs down. Faculty members also need to be encouraged to write and create their own digital textbooks and resources for students, he said. Digital texts would allow professors to use the most current resources. In the future, Johnson said professors could select chapters from different digital textbooks and combine it into one digital textbook so students wouldn’t have to buy different textbooks to read chapters that the professors like. The Special Collections Department Reading Room will be available by appointment during the summer sessions. Normal opening hours (Monday through Friday 8:00AM – 12:00PM; 1:00PM-5:00PM) will resume in the fall. If you are interested in viewing specific items from Special Collections, please call 812-237-2612 so that we may schedule an appointment. For University Archives, please call 812-237-8435. Appointment hours will be 8:00 a.m. and 4:30 p.m., Monday-Friday. Atlanta, GA – April 30, 2013 – LYRASIS members elected four new Board of Trustees members, who will each serve a three-year term. The Board also appointed non-member trustees and named new officers. The new Board members will start their terms at the beginning of the LYRASIS fiscal year on July 1, 2013. The LYRASIS Member Election was open for two weeks, beginning April 7 and closing April 21. LYRASIS members voted for candidates to fill the open Board positions, which included 2 at-large representatives from any library or organization type, 1 public librarian and 1 state librarian. The Board also announced the appointment of two non-member trustees: Jim Pierce, Director of Treasury Services at the Georgia Institute of Technology, serving his second term, and Gregor Trinkaus-Randall, Preservation Specialist, Massachusetts Board of Library Commissioners, serving his first term.